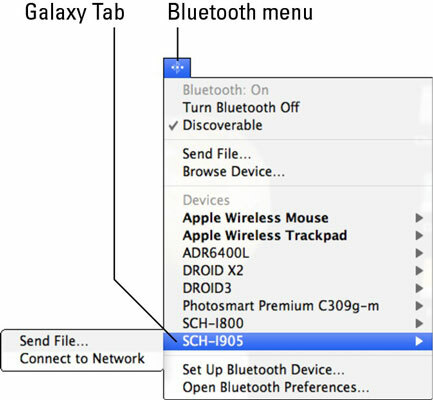 Use the Bluetooth menu on the Mac to choose the Galaxy Tab and then Send File. You can find the Bluetooth menu at the far-right end of the menu bar. The Galaxy Tab is probably named SCH-I905, which is Samsung’s super secret code name for the cellular Tab. Use the Select File to Send dialog box to browse for the file you want to send from the Mac to the Galaxy Tab. On the Galaxy Tab, choose the Bluetooth notification. In the dialog box that appears on the Tab, touch the Accept button to receive the file. Sadly, the Mac does not accept a file sent to it from the Galaxy Tab using the Bluetooth item from the Share menu. That method may work in the future, but at this time it does not.